The project is focused on building highly scalable, highly available and maintainable applications with the Command & Query Responsibility Segregation and the Event Sourcing patterns. The project was positioned as a learning journey. This guidance is designed to help you get started with the CQRS pattern and event sourcing. 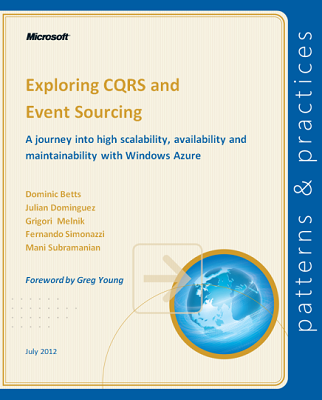 It is not intended to be the definitive guide to the CQRS pattern and event sourcing. Instead, it's a journal that describes the experiences of a development team with no prior CQRS proficiency in building, deploying (to Windows Azure), and maintaining a sample real-world complex enterprise system as a reference implementation (RI) to showcase various CQRS and ES concepts & techniques. The development team did not work in isolation; we actively sought input from industry experts and from a wider group of advisors to ensure that the guidance is both detailed and practical. The CQRS pattern and event sourcing are not mere simplistic solutions to the problems associated with large-scale, distributed systems. By providing you with both a working application and written guidance, we expect you'll be well prepared to embark on your own CQRS journey. Entity Framework 6.0 has improved Transactions. We will explore the UseTransaction() method which allows the context to participate into an already running transaction. We will also explore BeginTransaction() to start a new transaction. ASP.NET MVC 5 and ASP.NET Web API 2 added a very important feature called Filter Overrides. A good definition of filter overrides is available in release notes, "You can now override which filters apply to a given action method or controller, by specifying an override filter. Override filters specify a set of filter types that should not run for a given scope (action or controller). This allows you to add global filters, but then exclude some from specific actions or controllers". In this quick article, I will tell you the problem that filter overrides is trying to solve (with an example). I will also show you a quick fix of a bug that I found in ASP.NET MVC 5 regarding filter overrides. Entity Framework includes the MetadataWorkspace which gives you access to the metadata EF keeps about the shape of your model. The problem is that the Mapping section of this – the bit that maps entities types to tables and properties to columns – isn’t public. We do have a work item to make this public in one of the upcoming releases, but in EF6 and earlier releases it is still internal. Why, you ask, is it internal… because the metadata APIs in EF are a mess. The metadata APIs that are already public are bad… but the mapping one is worse. Whilst we can’t justify spending the time to rewrite the whole API – we do want to clean it up a bit before making it public.